Dude, Where are My Snow Tires? 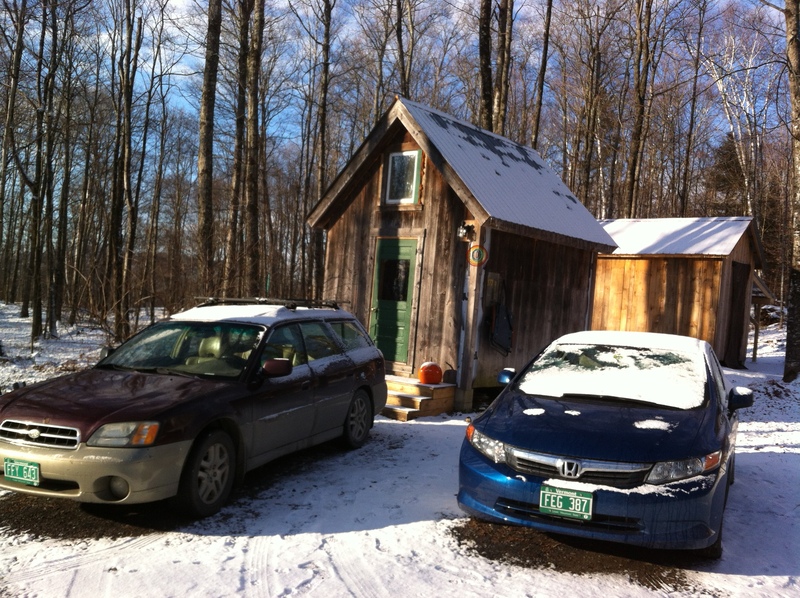 One huge advantage to Tiny House living is how much less expensive life becomes. Jamie is doing almost constant work on the house meaning ongoing material costs and I pay a monthly fee for my storage unit, but even so, the costs are vastly less than what I was paying for monthly rent. 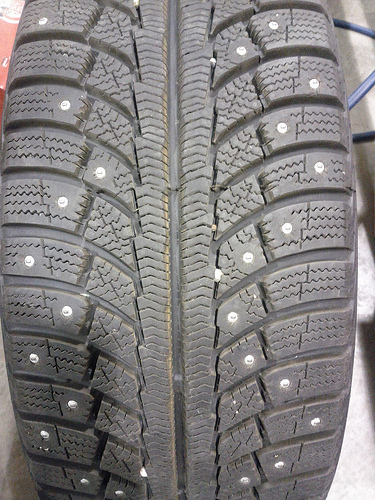 That said, there are some expenses (like snow tires) that are inevitable so I was prepared to bite the bullet and fork out the bucks to get a set of studded snows this winter. Jamie, on reading over this post, tells me when she lived in DC many of her friends had never considered why you’d need snow tires and I’d better explain. We live at the top of a steep road which is fairly low on the town’s plowing priority list meaning we are sometimes on our own if we want to get down to the main road and a bit closer to civilization. While you can typically get by with all weather tires depending on your car, it’s just a lot smarter to put on snow tires – or better, studded snow tires – when fall starts turning to winter. These are tires with an extra deep tread and have small metal spikes embedded in them to give you more grip and stability in icy conditions. A few weeks back when Jamie and I were down to the center of town, we noticed her parents had a stack of snow tires with a cute little “free” sign. Curious, we asked whose tires they were and learned Jamie’s Mom, Sarah, decided to get new tires this winter (she drives from central Vermont up to Burlington for work) because she needs extra reliable tires, but had four perfectly good snow tires that she was getting rid of. Lucky for me, we drive almost the same car and ta da! New tires for me! My commute is many fewer miles and I have the flexibility to work from home on really gross days so her pretty good tires are absolutely perfect for me. Yesterday afternoon and evening showered central Vermont with lovely, light flurries of snow. Though this is certainly expected in early November, it reminded me that driving a Civic – in the winter – in Vermont – without studded snow tires is not the smartest thing I’ve ever done. In my defense, the snow tires have made it INTO my car (i.e. in the trunk and back seat) but won’t be put ONTO my car until next week when I bring them to the garage. A little quick carpool planning (Jamie’s got 4WD) and we headed out on our way today but I wanted to share a shot of our cutie pie little house in the snow.